Newcomer Family Obituaries - Dennis M. Furjanic 1944 - 2019 - Newcomer Cremations, Funerals & Receptions. Please email Tom Furjanic at tomfurjanic@hotmail.com if you would like to attend. Dennis Michael Furjanic born April 2nd, 1944 passed away on April 4th, 2019. Dennis’ last wishes where to be cremated and his ashes spread in a glorious and magical place called Pagoda where he hunted with his friends. He wished for no service, and hoped that his life would be celebrated with a “big party!” That was classic Dennis!! His interests were many. What he cherished most was bow hunting for elk every fall In Flat Top Wilderness with his best friends, Rudy and George. His is other favorite activities were fishing, falconry, kayaking with his friend Christopher, gold prospecting, history buff, creating works of art, and last but not least, roasting pigs and lamb for family and friends. Dennis was an elite athlete excelling in football, baseball, and track & field. He played in the “Big 33”, Pennsylvania high school all-star football game. Colleges from across the country where recruiting him for their football programs. Legendary University of Alabama football coach Paul Bear Bryant offered him a full scholarship. Dennis ultimately accepted a scholarship from the University of Houston. College was not exactly Dennis’ cup of tea. He left after one year to play minor league professional football in the Atlantic Coast League. He was not eligible to play in the NFL until his college class graduated three years later. When his class graduated, he was eligible to play in the NFL, and he was drafted by the Denver Broncos. Multiple knee injuries from playing in the Atlantic Coast League robbed him of his best physical asset, his speed. Because of that, his potential on the football field was not reached. But, when that door closed, Dennis found other passions to pursue. He became an actor and a member of the Hollywood Actors Guild, and had roles in movies, and the TV miniseries “Centennial”. Perhaps his greatest post football talent was the emergence of his artistic talent. He immersed himself in a multitude of expressions of art. Photography, painting, and sculpture were all part of his portfolio. Carving marble and bronze sculpture was his love. His art was selected to be part of the NFL Players Association art exhibit at the 2006 Super Bowl. Dennis is survived by his brother Tom, sister Kathy, niece Karina, step-mother Lubie Furjanic, an aunt and uncle, several cousins, and many friends. The celebration of a life well lived will take place in Denver, Saturday April 20th at 2pm. Since a dinner will be served, an accurate attendance count in important. Please email Tom Furjanic at tomfurjanic@hotmail.com if you would like to attend. You will be sent an E-invitation detailing arrangements. To share a memory or leave a message for the family, please click the leave message tab above. Add your memories to the guest book of Dennis Furjanic. Denny was my closest friend. Though miles apart we managed to talk to each other every week or two. My brother Nicky and I considered him our brother. We hunted, camped and fished together for years. As childhood friends we got into lots of mischief together as adults we calmed down a bit. We played football together, worked out together etc.. Denny would have laid his life down for me as I would for him. Always at our house.. One of the family. He named his hawk after my mom "Ruby". His weekly chats will be missed. I loved Denny, his style, his candor, his wisdom, his artistic talent. He was a complete man. Denny will always be remembered by myself and my sisters Arlene and Jeanette. We knew him all of our lives. He was like a brother to Nicky and Rudy. So sad and sorry to hear about Dennis's passing. A great man and you will sure be missed. So grateful I had the opportunity to know you, l will always remember you and cherish our laughs we had back at the Etkin Johnson days. Rest easy Dennis.. So, so sorry for his passing my condolences and sincere sympathy. So happy I was able to spend time together last year when visiting in Colorado. May God be at your side. So sorry to hear of Dennis’s PASSING, May his soul Rest In Peace. Dennis was a neighbor to me in Bressler, PA. He and his family were great people and were all very proud of him and sorry to hear of his Passing. May GOD Bless him. Dennis certainly was quite an accomplished man. His talents were as vast as his many passions. I am proud to say he was part of my family. Even though distance always kept us apart, I could clearly see what an interesting and talented man he was. Rest easy Dennis. Feeling grateful you lived such a rich and full life. Sending my love and deepest condolences to all those people who loved you. Wherever Dennis’s new journey has taken him, I believe he is traveling with those he loved and lost. Dennis’s masterful earthly talents that he has left behind will live on in those who have had the pleasure and honor of knowing them. More important than any of Dennis’s talents was his generous and kind heart. Rest In Peace Cousin, we are all so proud of the life you have lived. I am sorry to hear about your loss. Please accept my condolences. Dennis and I were friends for about 25 years, which is a short time when compared to some of you. Tuesday morning, I watched as his bird was taken away to its new home. His cat went to its new home Monday evening. Please thank MaryAnn and Tom for the good work they did to get this done. Dennis loved his animals. Falconry was almost as important as elk hunting to Dennis. I studied falconry in high school, and it was one the things that brought us together. 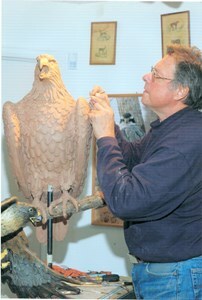 I miss helping him with his goshawk. Dennis honored me by entrusting me with the care of his animals and home when he was away. When I walked away from his now-empty house, I realized the magnitude of my loss. Dennis was my friend and I will miss him forever. Working with Dennis for many years was a pleasure. He was such an intense, focused guy. I have a beautiful Christmas ornament he made for me one year and I treasure it. A very dear friend, you will be missed. Dennis and I had absolutely nothing in common- except art. He was a hunter; I don't even eat meat. He was a football player; I don't DO sports. He fought in a war that I protested. I can't believe that I actually adored a Republican! And yet, and yet we managed to click. He was my work out partner at 24 Hour and my breakfast buddy at Rosie's. He was one of my biggest fans (some would say only fan) at the dance shows that I performed in with my dance studio. He even managed to be an unwilling "prop" for me in several numbers when I came off the stage into the audience. I loved his amazing art and he loved mine. Dennis and I shared a love of nature and gardening (ok, there IS another thing in common). The sculpture that he made for (and of) me resides in my spiritual garden. "Whirlwind Barbara" will forever remind me of you, Dennis- your artistic gifts, your huge heart, and your ability to grab life and live it to the fullest. I loved you more than either of us realized. I remember Denny while attending St. Mary's School, Steelton ,PA 17113 and Bishop McDevitt High School, Harrisburg, PA.He loved his grandparents hometown Bressler, and all the cousins and friends he played with while growing up. He came back to many BMHS Class of 1963 Reunions and visited family members.He shared with us the excellent sculptured items, including the eagle , that he created. May he find rest on his mountaintop. Amen. My condolences to the family. I have fond memories of Dennis. I was warned that he was difficult when I first met him. We bonded quickly at The Sporting Club roasting pigs, drinking beer and just chatting. I can do. Forgive me.